The Chrysler 300 is a large five-passenger sedan with rear-wheel drive or all-wheel drive. It is designed to appeal to consumers desiring something with a bit more personality than a regular family sedan, or as an alternative to popular Japanese or European entry-luxury sedans. The car’s American styling and optional V8 power set the 300 apart from its rivals. Later versions of the Chrysler 300 sedan feel noticeably more upscale, thanks to their higher-quality interior materials and additional technology features.This year’s 300 will probably stand out a little more because of its updated front and rear styling, but the most important news is on the technology front. There are now optional safety features like adaptive cruise control (which can bring the car to come to a complete stop in traffic) and an available lane departure/lane-keeping assist system that helps keep you in your lane along the highway. In the cabin, there’s now a full-color instrument panel in front of the driver, and the 8.4-inch touchscreen in the center stack gets Chrysler’s latest Uconnect features that include voice commands (including voice-texting), emergency roadside assistance and WiFi hotspot access. 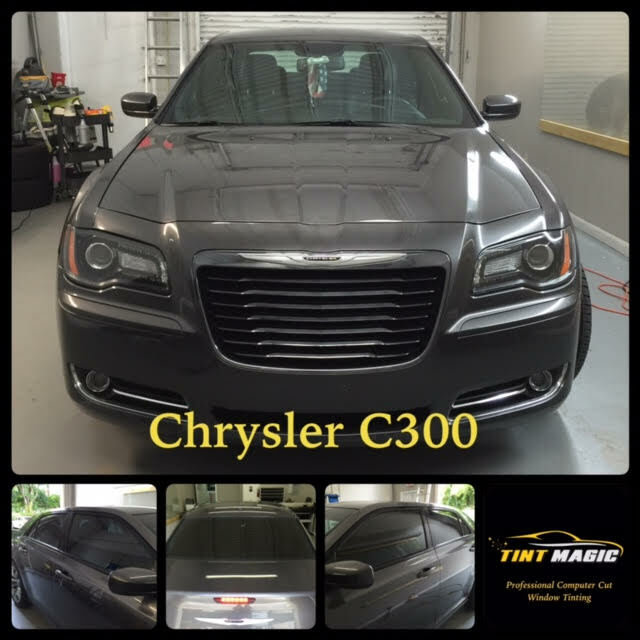 Tint Magic Window Tinting have applied on Chrysler 300 Gold Package for the best heat rejection and 99% UV protection. Call us for a free estimate! 954-840-7883. Tint Magic Window Tinting serving, Coral Springs, Parkland, Tamarac,Coconut Creek, Sunrise, Weston and Margate.